"Fortunately, there’s tomorrow," Brunson told his table minutes before busting out. 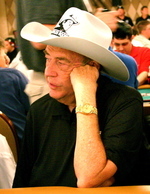 The 2005 WSOP Main Event ended early for Doyle Brunson. Two hands before the bust, Brunson lost 1k after raising a pot from mid-position. The big blind made it 2,500 to go. A limper in early position made it 5k. Brunson bailed out, the big blind called, and it was Aces vs. Kings. The Aces held, but had Brunson stayed in, he told us all that he would’ve made a boat. Then, Brunson pushed his last 3,200 in with K-J. He was called by Matthew Hilger (a big stack at the table) with pocket 7’s. The 7’s held, and Doyle Brunson made his exit to a (near) standing ovation. So how did the Mike Kleinstub fella get knocked out?